Becoming better is the messiest work. It’s uncertain and humbling, even raw. But it’s also hopeful and affirming when we discover that the smallest moments accumulate into the most significant change. Here’s to wondering about the small moments throughout this mini-blog. the ASK: I like to switch up groupings of students on a regular basis and am always wondering how do make those transitions as seamless as possible. the TRY: Each student gets a magnet with his/her name on it. (For details on making these, see below.) 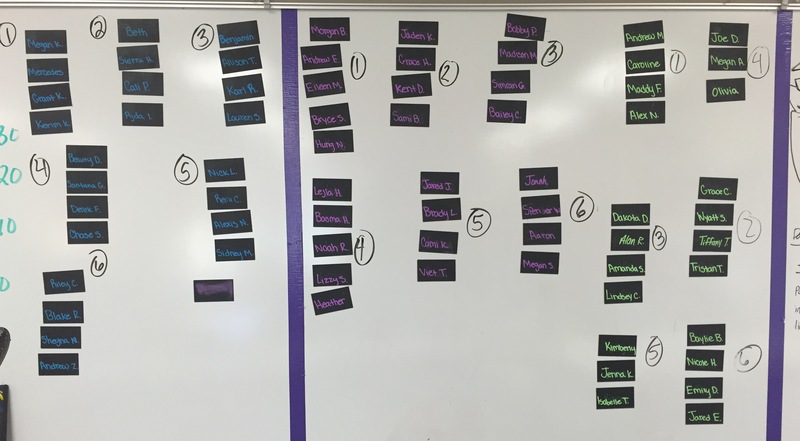 I leave the magnets up on a white board in the room all the time and when they walk in and see the table tents placed on groups of desks, they know they have new groups and can quickly find out who they’re working with by going to the whiteboard. 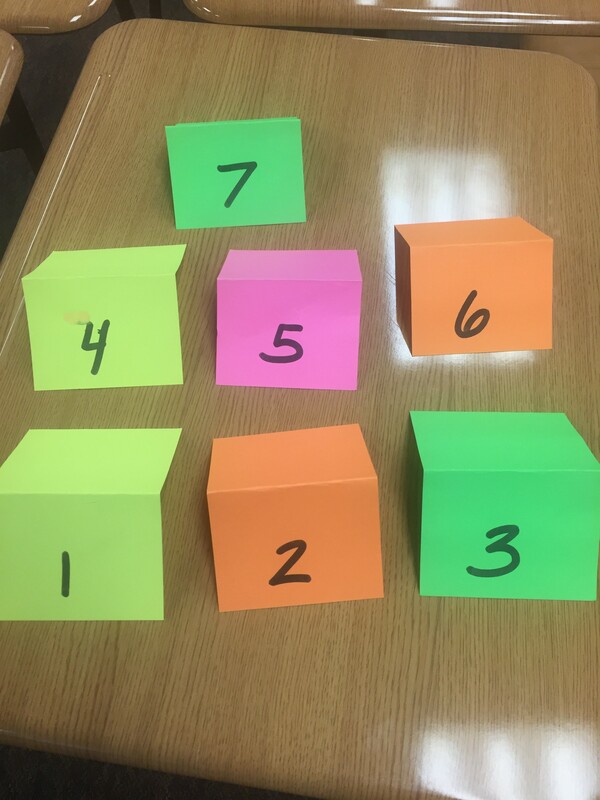 the LEARN: Differentiating and grouping is part of the on-going cadence of the classroom and having a simple, clear way of implementing it helps us save time and keep our focus on the learning instead of the logistics. Here’s my four-step magnet DIY. Purchase business card size magnets from the local office supply store. Collect business cards (often the school office has these) and place them on the adhesive side of the magnets. Cover the business cards (now on the magnets) with black board spray paint. Use a chalk marker to label with student names, making them easy to reuse the next semester! the ASK: I often wonder how to minimize the effects of being gone from class when I travel to work with teachers in other places. Here’s an experiment! the TRY: Using FaceTime and some devices, I’ve found a way to still teach from the road. 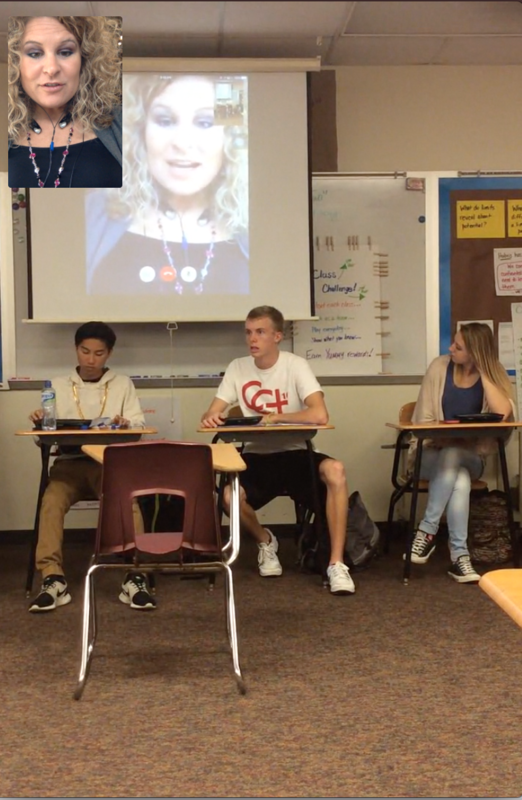 Ahead of time, I arrange with a student to connect via FaceTime at the beginning of class with his/her iPad. Then, the student connects to the projector and it’s like I’m right there! the LEARN: I stay connected to the students, they stay connected to me, we stay connected to our learning goals. It’s also really helpful for the sub, because I can give directions or help facilitate a discussion that he/she can then follow-through on or contribute to in more informed ways. 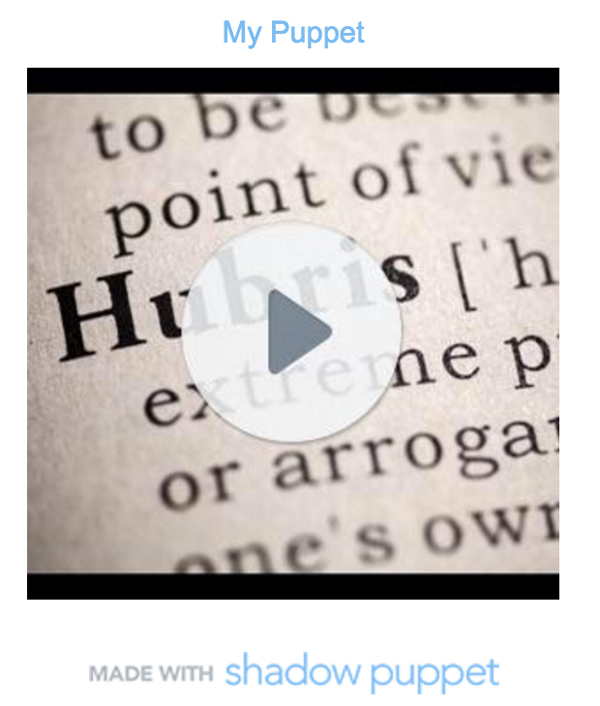 the ASK: I know that audience is everything when comes to writing or creating, so I was curious about how to create an accessible, authentic audience for students’ hubris extended definitions. 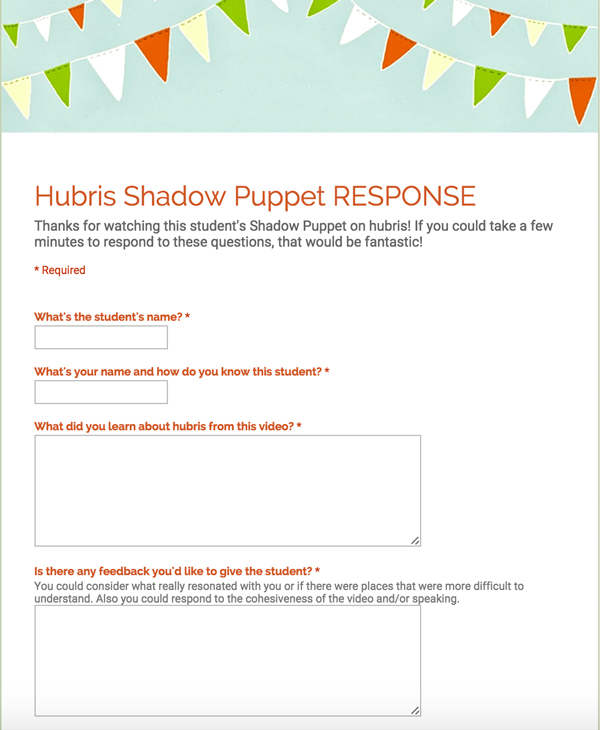 the TRY: Ask students to consider not just explaining hubris, but teach it to a parent or other adult mentor through their Shadow Puppet. Then, use a Google Form to have the adult readers provide feedback in a seamless way that I could then pass on to the students. 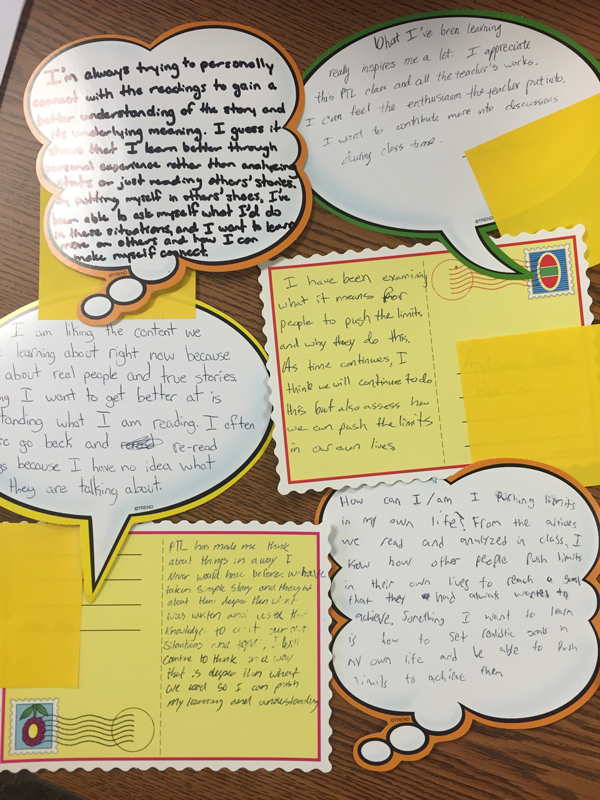 the LEARN: One of my favorite parts of this was watching how students invited their adult readers to participate and see how the feedback resonated with the kids when it came from someone outside the school. 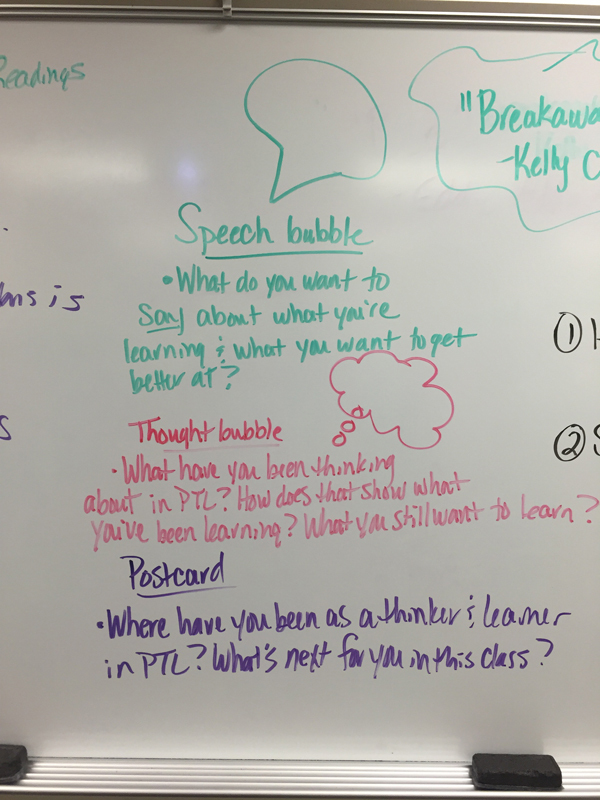 the ASK: After a week of thinking about and exploring the concept of hubris, I wondered how students could continue to construct their learning in a digital way. the TRY: Each student used a storyboard (blank PowerPoint slides printed with the notes) to plot out his or her synthesis of hubris. They extended their definition using examples and images then practices speaking by recording it all on Shadow Puppet. the LEARN: The best technology tools are often the simplest. 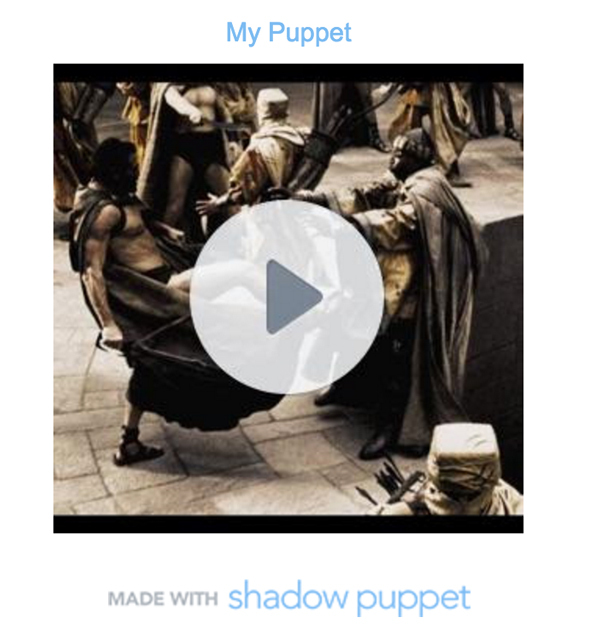 shadow Puppet is really intuitive and allows for revision. Most importantly the storyboard work is crucial; it helps the focus stay on the learning purpose and keeps the technology as the tool instead of the other way around. Be sure to check out the next post to see how we got parents involved in providing feedback. Here are a few student examples! the ASK: Our school has traditional parent/teacher conferences where we each have a table in the gym and parents can come stand in line to speak with a teacher. I wondered how to quickly get student voices in the conversation. the TRY: The first few minutes of class the day of conferences I put out speech bubbles, thought bubbles and postcards and asked students to reflect on their learning so far this year. 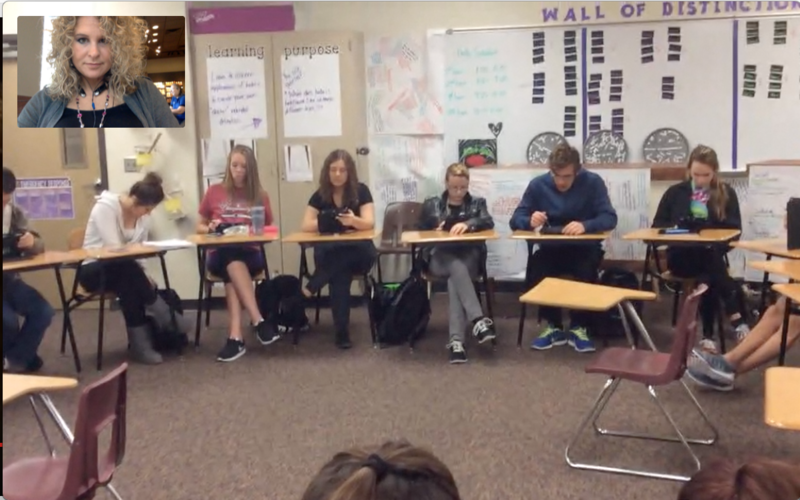 the LEARN: I learned that when I started conference conversations with student voice (even if it was informal and quick) our conversations were more about learning than just grades. Not only that, but I loved the smiles on parents’ faces when they saw handwriting of their students. the ASK: I wondered how to help students go from passive and compliant during discussions to becoming more engaged. the TRY: Whether students are presenting, discussing, or talking about writing we must use every moment to further our conversations about our learning. But it isn’t always easy. 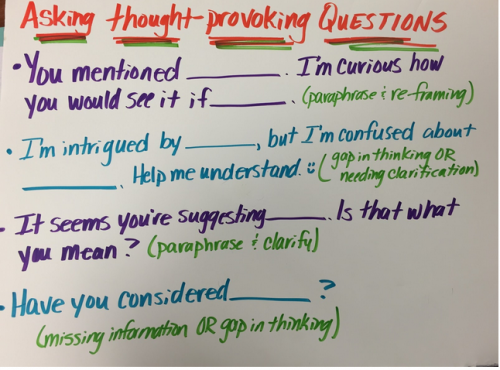 I like using these question stems to help establish our routines and give students language when they can’t find their own. the LEARN: Some students naturally know how to ask questions, but most need to learn this explicitly. I learned that someone else’s words can help them find their own.